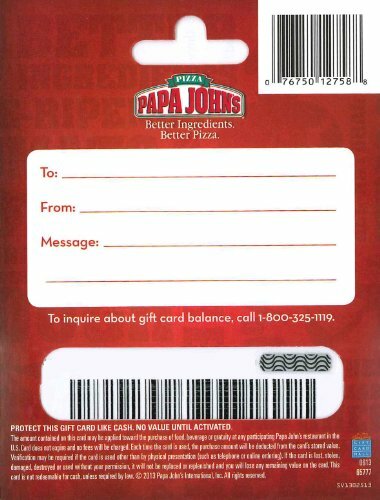 Papa John’s Gift Cards can be given to anyone who loves great tasting pizza! Peyton Manning would want you to choose this giftcard and he might even throw the pizza to the recipients mailbox. A perfect gift for people who are generally “hard to buy for” on your shopping list. Plus, Papa John’s Gift Cards do not expire, and there are no service fees. To find a location near you, visit http://www.papajohns.com. The perfect gift for “hard to buy for” people on your shopping list. 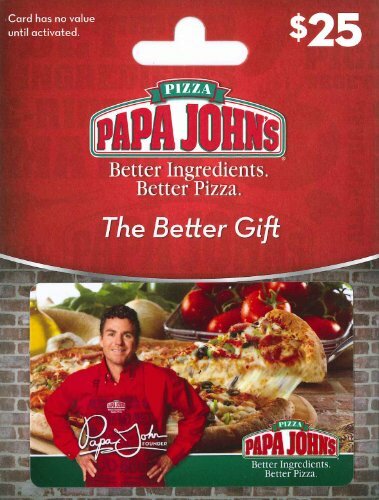 Papa John’s Gift Cards are redeemable in the U.S., including AK and HI, only.